Honda City is the most successful sedan in the Indian auto market because of its stylish look, comfortable passenger cabin, powerful engine which offers good mileage too, low maintenance and last but not the least Honda’s brand name which is very well known for high quality products. The highly advanced comfort features and spacious passenger cabin with comfortable seats of the new Honda City ensures very comfortable and pleasant ride. Its advanced music system includes 5 inches screen, and it has ports for USB devices, Aux-in to connect external media sources, and ports to connect iPod and iPhone. It can read audio files in multiple formats including MP3, WMA, AAC, etc. It has four powerful speakers, tweeters and speed sensitive sound control system which ensures that you will enjoy your favorite track at best. 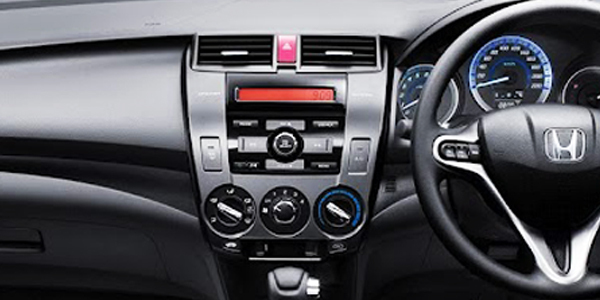 The new Honda City has steering mounted audio control buttons to ensure you can enjoy your music without distracting your eyes from road. The variants of Honda City that offer music system as standard include 20th Anniversary Edition CVT Petrol, 20th Anniversary Edition MT Diesel, S MT Petrol, SV MT Diesel, SV MT Edge Edition Diesel, SV MT Edge Edition Petrol, SV MT Petrol, V CVT Petrol, V MT Diesel, V MT Petrol, VX MT Diesel, VX MT Petrol, ZX CVT Petrol, ZX MT Diesel, ZX MT Petrol. The variants of Honda City that do not offer music system as standard include VX CVT Petrol.